Being the meat lover that I am, this mixed grill plate was delicious. It is at the nuevo Los Faroles restaurant on Ancha de San Antonio. The viejo Los Faroles has long been one of our favorite night-time taco places and I first wrote about them about two years ago here. They use to serve only tacos, stuffed baked potatoes and sometimes beans. The place was so tiny, only 5 or 6 tables and a few chairs at the bar but if all the seats were full, no one could move. Now they have taken over a open area behind the old restaurant that was a part of the Aristos Hotel grounds. All new furniture, new kitchen, dance floor, bar, a new menu and that new menu includes this mixed grill plate for two. We ordered two mixed grill plates for the six of us and had some meat to take home. 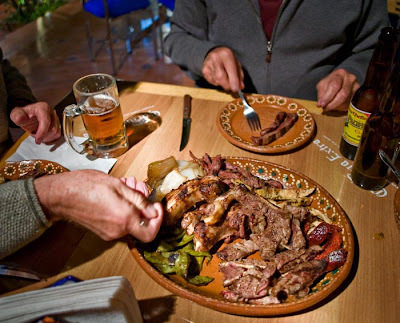 The plate includes ribs, arrachera, pork, chicken, chorizo and grilled onions and nopales. Can you believe that the cost including drinks and tip was about 110 pesos a person. There are other things on the menu but one of our group had eaten there last week and once they told us about the Mixed Grill Plate, I quit reading the menu. So........you know what that means, we have to go back very soon. Amiga - Being a vegetarian I can only get excited about those Pacifico's. Billie--I easily get into a rut, so when it's time to go to a restaurant, I ave a really limited selection. Los Faroles is an example of a good place I've never managed to find. Thanks for letting us know about it. I'll be there very soon. Plus, I liked the gesturing hands in the food photo. Much more energy than the pictures of plates I do. Juan, There were grilled onions and nopales on the plate. And the next time we go, I'll check out vegetarian fare. John, It was good and the atmosphere was very nice. I have a feeling it will be full on the weekends with Mexican families because they have always had a lot of Mexicans in the Taco place. Thanks for the comment on the picture. I couldn't have made a picture without hands going for the food. There was no other choice. Hahaha! It is on the same side of the street as the Instituto and between the Instituto and Cardo.